Java 4 and later include an excellent regular expression library in the form of the java.util.regex package. The regex engine is very fast (by any standard, not Java standards), and the regex flavor very comprehensive. RegexBuddy makes it very easy to use the power of regexes in your Java source code. If you copied a regex written for another programming language, simply paste it into RegexBuddy, select the original language, and then convert the regex to the specific version of Java you're working with. If you're writing a code library that needs to work with multiple versions of Java, compare your regex between those Java versions to make sure it will work exactly the same with all of them. RegexBuddy knows all the differences, including the bugs, in the Pattern class in Java 4 through 10. 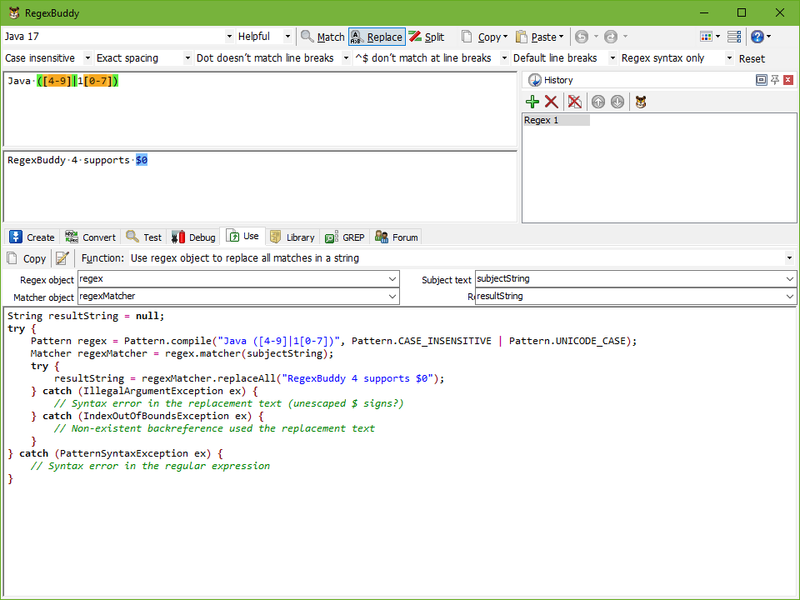 If you created a new regular expression, test and debug it in RegexBuddy before using it in your Java source code. Test each regex in RegexBuddy's safe sandbox without risking precious data. Quickly apply the regex to a wide variety of input and sample data, without having to produce that input through your application. Finally, let RegexBuddy generate a source code snippet that you can copy and paste directly into Eclipse, JBuilder or whichever IDE or Java code editor you use. Just choose what you want to use the regex for, and a fully functional code snippet is ready. You can change the names of variables and parameters to suit your naming style or the current situation, which RegexBuddy automatically remembers. Don't bother trying to remember which classes to use or which methods to call. And don't worry about properly escaping backslashes and quotes. Just tell RegexBuddy what you want to do, and you will get the proper Java code straight away. Anything can be done: testing a string for a match, extracting search matches, validating input, search-and-replace, splitting a string, etc. Choose whether to create a reusable regex object for best runtime performance, or whether to use a one-line convenience function for maximum source code readability. RegexBuddy wraps its code with the proper try..catch statements, so you will never get unhandled exceptions out of the blue. "Just wanted to say that I have been using RegexBuddy for 4 years now and I cannot even begin to calculate the time it has saved me. I often have had to write Java programs that were required to deal with unstructured, or at best, semi-structured data. Often from old legacy systems. I learned the power of regular expressions several years ago, but even after I had written hundreds of them I'd sometimes get stumped when I tried to come up with the expression needed to do some sort of complex text operation. I would often spend many fruitless hours trying to come up with an expression or expressions to do the job. I stumbled across RegexBuddy and after using the demo for only a few minutes, I immediately purchased it. It was like a God-send! Using it I can rapidly build even the most complex expressions and just as important, can test them right on the spot without having to compile some little test case or perform some similar time consuming hit and miss approach to developing the expression."